Turning right and driving into a road that you are not supposed to enter may happen if there are no signs telling you that it is the wrong road for you. Prevent such incidents and, subsequently, accidents that come with such mistakes by using No Right Turn Signs from Seton. Often, driving into the wrong lanes or areas can be attributed to a lapse in judgment or lack of warning signs. Eliminate one of these factors by installing traffic signs that inform drivers when there are no turns available for them to make. Wrong-way driving is on of the causes of car accidents since head-on car crashes is often the end result. Posting eye-catching warning signs would go a long way in preventing such incidents from occurring in your facility or property. Let motorists know when not to make a right turn. Each year, numerous car accidents are caused by drivers turning into a street they should not enter. This maneuver often puts a car directly into the path of an oncoming vehicle. Such is the consequence of the simple neglect of looking before making a turn, or the lack of signs warning of such dangers. Prevent such incidents from occurring in your facility by posting Seton’s No Right Turn Signs. Driving into the wrong lane or road area often leads to serious personal injuries or fatalities. One of the most common scenarios when this happens is when, after making a wrong turn, the driver ends up on the wrong freeway ramp. The motorist then finds himself driving against oncoming traffic, which maybe entering or exiting the freeway. Protect motorists from driving into traffic and other dangerous scenarios. Sometimes, drivers end up driving into a one-way road in the wrong direction. This is a type of car accident that occurs many times in urban areas, since metropolitan streets and roads usually have traffic flowing in one direction instead of two. As a result of making a wrong turn, drivers can end up on the wrong side of the road. Insufficient or non-existent information can result in a motorist driving the wrong way. 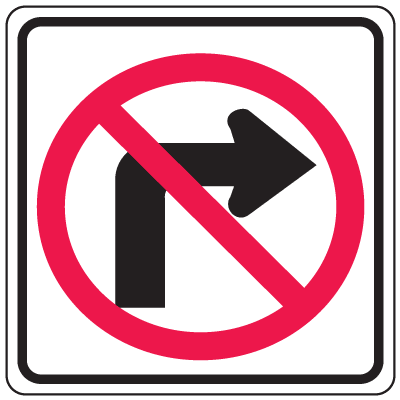 Provide motorists with the proper No Right Turn Signs from Seton. Chose the best traffic control signs for your needs and protect drivers against serious accidents.